Here are two sample HLG clips shot by the GH5. Default exposure was used for these clips and no editing was performed. 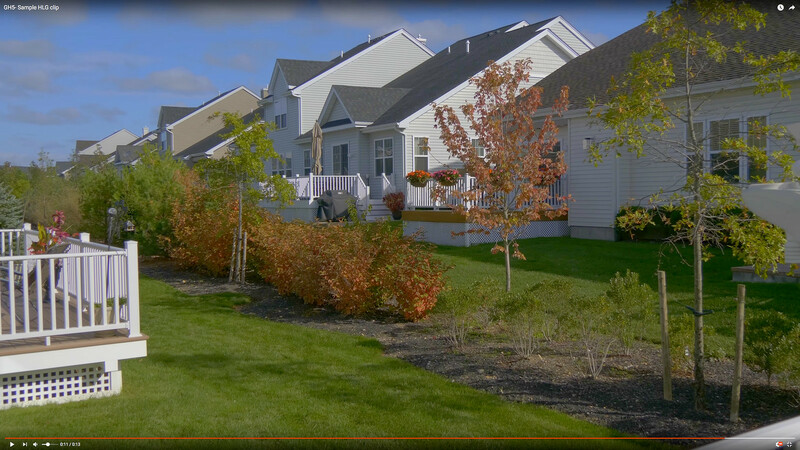 Watching both clips on my garden variety Rec.709 12.2" 1440p tablet display in YouTube app they look OK to me. The color balance and gamma don't look ideal of course but to be honest look no worse than those contrived grading looks in countless online videos from raw non-HLG log gamma footage I have seen so far. The colors here seem a bit compressed compared to the colors in regular Rec.709 videos but this is hard to tell precisely because I have no idea how the actual scenes looked. The DR seems compressed as well but nowhere near the distinctly wash-out looks I normally see in ungraded log gamma footage on regular Rec.709 monitors. Though my tablet has no waveform display but judging by the look of it the highlights seem to be contained within the 100 IRE threshold while the darkest shadows look safely above 0 IRE with some details still visible. Will play with them some more on my computer when I get back home. Would be interesting to see how this baked-in HLG clips look on my calibrated monitor in both Rec.709 and Rec.2020 color space. I have a feeling they wouldn't look too bad (or too wrong). The colors open up dramatically when actually played on an HLG capable display, but viewing on my computer monitor, I can definitely see why you'd call the colors a bit 'compressed'. No compression that I can see when shown on my HLG displays. However to my eyes the darker areas seem a bit too dark, but that's the same thing I tend to see when watching typical HDR. When the darker areas are compensated for, the brighter areas tend to blow out on the professional HDR10 productions I've seen. I really haven't played with this much, but I will in the future. As I've said, I think there's a real art to shooting and grading HDR that actually adds to the viewing experience and doesn't make you say, "Oh, they're trying to hit me over the head that this was shot in HDR". IMO this should border on being transparent to the viewer. If it calls attention to itself, it may not have been done properly. But as I've said, it's really fun that the GH5 makes this such an effortless process when displayed on a HLG display. Here is a screenshot off my 28" Dell 4K monitor without HLG and an adjusted screenshot on Flickr. I guess a HLG screenshot would look somewhat like that. Joe, thanks for that, but in actuality it looks much better on my HLG enabled OLED than your corrected pix. The colors are much more natural in the HLG version. Of course the shot looks better in hlg (it better be true). How about the same scene shot using hlg and then the settings you usually use? That is the issue - how much worse viewed on a normal screen the hlg video is than if shot normally. I will try your exercise tomorrow. Obviously the 'normal' shot will look considerably better than the HLG shot on a non-HLG display. So at least to me, this is somewhat of a pointless exercise, but I'll play. True the HLG looks better on a non-HLG display than ungraded Slog/Vlog, but neither looks great. I wouldn't condemn non-graded Slog/Vlog on a display any more than I would HLG on a non-HLG display. HLG obviously needs a targeted display. No. Vlog and slog can be converted to rec709 to look good on regular screens. Hlg video is very difficult, if not impossible, to convert to look good on rec709 screens. The idea is that, as is, it does not look that bad on rec709 screens, so let's see. This is not a game, it's a major issue of this new standard for HDR. Let me say it again: hlg is a delivery profile for viewing only and not meant for conversion. Vlog and slog are shooting profiles not meant for display at all but for grading. No one displays RAW slog or vlog on any screen, but the claim is that hlg looks ok on non HDR screens. So lets see. Thanks for your efforts on this; it is not at all a GH5 issue, as Sony is offering the same option as is Atomos. Yes, I understand that Vlog/Slog are not intended for viewing without grading. Obviously. With that said, I can assure you that HLG on a non-HLG display will not look great and I have no idea who is claiming otherwise. It is NOT intended for viewing on a non-HLG display and Panasonic has not said otherwise. I can only say what I said before, it will look better than RAW Slog/Vlog...and again, yes, RAW is not intended for ungraded viewing. I’m simply trying to put things in perspective since most of us know what ungraded Slog looks like. RAW video files cannot be displayed on any TV at all. Slog files are not RAW, but I get what you mean. So, if HLG files do not look very good on non HLG displays (we will see how bad), which is what most people have, and HLG files cannot even be edited to ever look good on a non HLG display, why would anyone want to shoot using HLG and be locked in to that specific standard forever? I can see making an HLG video from Slog or Vlog, but it just seems nuts to ever shoot that way except to have a little fun once in a while. I get it, it was a free upgrade so why not have fun? Btw, my TV was just upgraded through an update to play HLG. And my Shogun Inferno was updated to record HLG from RAW. So, HLG is now a common HDR standard. Yes it is intended for viewing on non-HLG displays. It's also wrong to say HLG is not intended for grading. Certainly it's less necessary to grade it than regular log gammas like SLog2/3 or VLog but it absolutely benefits from it. It's wrong to conclude everything about HLG just from what is seen straight from the camera. Check out this HLG video from LG. It looks fantastic in SDR. HLG is after all, regular SDR in the lower half of the gamma curve, and log gamma in the upper half, thus hybrid. I would bet if you would tweak the HLG image with in-camera settings where it looked the best it can be in SDR, it would be even better in HLG, instead of trying to do it the other way around. Just tried watching Ken's clips again now on the Sony Xperia XZ Premium's 5.5" 4K HDR screen set to "Standard". They now looked way better and probably more accurate than they did on my older and non-HDR Samsung tablet screen. There was much better distinction among the fall foilage colors and also among the different shades of greens in the trees and grass at the bottom. The sky was bluer too. What Tom says makes sense since the overall gamma level appeared to be more or less correct with nicer, more vibrant colors, and highlights, midtones and shadows looking natural without clippings or being flattened. I don't know if the HLG meta-data were somehow tagged onto the clips to flag a capable display device such as the one on the XZ Premium or the tagging was built into the YouTube app so that the same display that can play both HLG and regular Rec.709 can display both kinds of videos correctly without the viewers having to make any adjustments. It looks to me if you have an HLG or HDR capable viewing device and you watch the materials via the YouTube app, things are all rosy and effortless. If you don't, the results can be varied though not to the extent of ungraded log gamma videos. But what I really want to find out is how much we can do in post to get HLG videos like Ken's to look as close to normal as they can on standard non-HLG or non-HDR viewing devices. Or if it can't be done? You miss the point that if you’re shooting for your own use and your own viewing, then it can make perfect sense to shoot in HLG. Mark, most of what I shoot and I suspect much of what many others shoot, is not necessarily uploaded for the world to see. Quite the contrary. At this point I have no idea how much I’d shoot in HLG and to be honest, I have no idea how it looks on a non-HLG TV. I’ve only seen it in its SDR form on my IMac, but never on a SDR TV (I don’t have any, but I’ve yet to see if I can manually turn off the HLG function of my OLED). According to Tom, it can be made to look quite good. If so, your compatibility argument goes out the window. Tom, not according to Panasonic. In fact when you switch to the HLG mode on the GH5, you get a clear prompt that cautions you that this is intended for playback on a HLG-enabled TV. Yes, it doesn’t say it ‘won’t’ play on a SDR TV, but it clearly states that the target display should be a HLG capable display. As to the lack of grading capabilities of HLG, that wasn’t my claim, but rather Mark’s. Personally I have no idea, but I’ll take your word for it. However this brings up an interesting question. If you grade HLG for optimum SDR playback, aren’t you then compromising optimum HLG playback? How do you simultaneously grade for both? I can only assume you need to make two separate edits. Edit: Tom, looking at that LG video on my IPad, you’re right, it looks great in SDR. Later I’ll take a look at this on my OLED, but I’m not sure the YouTube app is HLG enabled. Last edited by Ken Ross; 10-14-2017 at 04:54 AM. That was precisely my point in an earlier post. In the end, the effortless nature of HLG will be a significant attraction for many. HLG is not going away and will be much more common in the future. So an update on the YouTube HLG video that Tom linked to from LG. I watched it on my HLG-enabled OLED, and the clip played in SDR. It did look excellent, but the 'HLG' logo in the upper right of my OLED, never lit up. So this could be due to a couple of things. First, the video may not have been flagged for HLG and thus my display never kicked into the HLG mode as it does with my HLG GH5 clips. Second, the YouTube app itself on my OLED may not have HLG capability, even though it does have HDR capability as evidenced by the many YouTube HDR clips I can play on that app. I tried this on my Nvidia Shield Pro, but it is not enabled for any form of HDR at the current time. Nvidia promises an upgrade in the future, but I have no idea what form of HDR it will eventually be compatible with. After playing a number of HDR clips on YouTube, from a variety of sources, and then going back to my HLG clips from the GH5, I'm actually more impressed than I was before with the GH5's HLG. It's truly amazing that I can get these results with virtually no effort. I haven't even tried to optimize things, so I'm reasonably confident I can further improve results with the in-camera settings. Edit: Scratch possibility #2 above. I just checked my posted HLG clip from YouTube, and the HLG logo lights up in the upper right of my OLED. So the LG OLED's YouTube app is indeed HLG capable. That leads me to believe the LG clip that Tom linked to is simply not carrying an HLG tag or its tagged improperly. Last edited by Ken Ross; 10-14-2017 at 07:09 AM. 1. Let's see an outdoor scene whose colors and DR we can relate to, rather than an artificially lit club scene like in the above video - clearly the colors in that are quite odd, and not intended to be anything but. Its a neat video. But looking good and being accurate are not the same. We want to know the disparity between what the scene looks like and what HLG viewed in REC709 provides. Ken: show us the two shots, and we can all decide. We can trust your regular shot will be as accurate as can be. 2. HLG is not just a different gamma curve, it is also a difference color gamut. Translating that color gamut to REC709 is another challenge for trying to make HLG video look good on REC709 viewers by grading. 3. No one has claimed you cannot grade HLG video - you can grade any video. The issue is whether it can be graded to attain the same optimized REC709 look as one would have gotten shooting REC709. And, especially compared with going from Slog/Vlog to REC709. 4. When you are shooting HLG, what you see in the viewfinder is the REC709 version, since the camera display is not HLG. That will make adjusting exposure and any color controls while shooting to difficult to judge. The same is true of Vlog or Slog, except now many cameras have a viewing LUT to transform the Slog/Vlog to REC709. In principle that could be done for HLG, but I don't see that available. 5. By design, HLG provides less dynamic range than Slog/Vlog. Its hybrid gamma is a compromise, and some indeed have made the claim that HLG can look good on REC709 screens. No one claims it will look just as good as a REC709 shot - so, again, lets see the difference. 6. And, to repeat, if you shoot in Vlog/Slog you can make HLG or HD10 HDR videos and SDR videos without compromise (yes, two renders). 7. Having an in-camera HLG option is better than not having, but everyone should be aware of its limitations. Mark, lots of good posts here and some quite informative, no babble that I've read. As for the clip Tom linked to, who said anything about 'accurate color'. This was simply supposed to be an HLG clip from LG. Nothing more nothing less. At any rate no HLG today with the rain. This will be done on a sunny day. So until then, enjoy the 'babble'. Oh, and no, I'm going to try to 'doctor' the SDR clip to try to make the HLG clip look as good as it can, just as I carefully showed only the zooming AF clips from the RX10iii that didn't screw up the focus. What is HLG? On my computer screen is appears quite dark. Yes, a lot of the information here is useful, and a lot is defensive babble that just gets in the way. What is useful is the two clips that you can provide. Tom is correct that there is a claim that HLG clips look ok viewed on REC709 screens (hence the compromised gamma curve relative to log). Though I think Panasonic has it right. So this will be really useful in general. Especially since we know that normal (REC709) GH5 clips look good, in the sense of accurate. When it comes to video accuracy, you are the #1 guy. And I look forward to discussing our impressions of any differences between the two clips and your view of how well they represented the scene you saw with your eyes. I do not think either one of us has a stake in what is the result. Last edited by markr041; 10-14-2017 at 12:58 PM. Mark, there are times that I just find you utterly exasperating. Why must you always be in an attack mode? Good grief. My comments were not babble nor did I interpret anyone else's comments as babble. Your definition of 'defensive' is hugely different than mine. One could easily interpret your comments in many threads as, 'anything that doesn't exist on Sony cameras is fluff & unnecessary and anything that does is essential and well-executed'. Yeah, I know, more babble. If you demonstrated proper etiquette when asking for someone to provide something like the 2 clips you requested, you'd simply ask for them. Period. Instead you start out with your babble nonsense, then proceed to attack an utterly innocent comment that the clip Tom posted was not intended for color accuracy but rather to show how good an HLG clip can look in SDR. I give up. I will provide the clips when I get a chance, but this childish behavior is just a bit much. Time for the Yankee game. Ba bye. A new color space. If your display doesn't support this it would generally show the video with dull colors and a skewed level of contrast that is biased towards the shadows causing the footage to appear too dark. I am sorry you take everything so personal and have stooped to name calling. You are now even betraying what I thought you believed - that we judge video quality by accuracy to reality. Your defense of the clip that was posted makes no sense - a video "looking good" is a silly concept, and against everything I thought you defended against. That video had faces colored blue in some clips- was that HLG giving us bizarre colors? Or just mood lighting? It was very creative and interesting, but useless to judge how HLG conveys reality viewed in REC709 (I actually saw the same video in HLG on an LG OLED TV playing in a store - it looked just as unnatural seen that way, but it sure was eye-catching). My comment that the video was not informative about the limitations of HLG (or even its capabilities) wasn't a criticism of Tim or you, just a reminder that we want to see a real test, which you can do, and do well. "Looking good" takes us back to those pretentious graders who think teal and orange tints "look good." On EOSHD the graded videos posted are appalling, and they get scores of 'likes." What has happened to you? The babble is about the speculating about how HLG *would* look in REC709 or in posting videos that "look good." Nothing else. The point is for everyone to stop speculating and making statements about what is the purpose of HLG and just let's have the video comparison. Too bad it rained. Yes, my view is that HLG does not look good viewed in REC709 based on what I have read and seen, but I would love to be proved wrong. Then we can all shoot in HLG! Sorry to spoil your enthusiasm with HLG; I get that critical analytical comments can spoil the fun. That is not the intent of my posts; it's so we get a balanced view of exactly what is useful about a feature and what not. I was all excited about HDR and produced some HDR videos that have over 4000 views on YouTube. I concluded it wasn't worth it, since most people cannot see videos in HDR, although by shooting log I can always do it again. Btw, HLG is available on new Sony cameras - your seeing everything as about brand competition reveals how misplaced your thinking has become. And HLG was just implemented on my Shogun Inferno so the question of whether anyone should shoot in HLG as general practice is as relevant to you as it is to me, and will increasingly be relevant to everyone. Last edited by markr041; 10-14-2017 at 07:31 PM. First off there was no name calling, so let’s cut the melodrama and stop taking things so personally. Talk about that infamous pot. Second, the clip’s colors in that LG HLG video were very likely an artistic effect created by the lighting. Why do I sat that? Because virtually every video of that genre has similar effects! Duh. This isn’t rocket science. Third, give up already on this brand competition accusation nonsense. My purchases prove that I am brand agnostic and you stating otherwise is a distortion of reality. This is just becoming inane Mark, it really is. Most importantly, it’s very obvious you have little intention of taking HLG seriously. You very obviously have a negative predisposition out of the box. That’s a poor scientific approach, IMO. If you don’t believe me, please reread all your posts on the subject, but do so objectively. In the end, what you use is your choice just as it is for all of us. But please stop pretending you’re being objective about this. You’re not. Preaching why we shouldn’t be using HLG is simply a reflection of your position and nothing more. We are all big boys and girls here and we can all make up our own minds. We all have different needs and objectives. I’ve already stated that I don’t know what I’ll do since I haven’t experimented with HLG nearly enough. My decision will be based on the benefits seen on MY TV, not Joe Blow’s TV. If I need to shoot something that I must share with others, then obviously that will be a factor for that project. If I don’t, then the HLG option might be a great one, particularly having seen how it looks on my OLED. Where you and I differ the most, is you don’t understand that people might shoot HLG for display on their own HLG enabled TV without concern that the world might not be able to see it as we see it. Hell, most people don’t see what I see on my calibrated OLED with material that I can share. However most of what I shoot is for me and my wife. Period. I post very little of the totality of what I shoot. I suspect I’m not alone. Finally, if you now have HLG capabilities on your Shogun, I have no idea why you’re so anxious for me to conduct your experiment. It seems you are now quite capable of this exercise on your own. So why haven’t you? Did I miss the *video* comparison of HLG versus Standard for the same scene, that would benefit anyone contemplating shooting with HLG or trading up to a camera that has the capability? I came back to this thread hoping to get more info on HLG, as it is now an option on many newer cameras shooting video. So far, from what I have seen HLG video looks patently inferior viewed on non-HLG screens to REC709-shot video viewed on non-HLG screens. And if one actually edits video, rendering an HLG video that retains the metadata that enables TV's and YouTube to recognize it is HLG is a big pain. HLG is NOT so far a convenient way to shoot and view HDR unless one just views camera clips, as evidently is what people who post here a lot do, amazingly. Anyone have a counterexample? Maybe I missed this, and it is in another thread. If not, And Mr. Ross does not want to do this, I can post the comparison - HLG versus non HLG in the same video, same scene. Anyone still care? Or will this just result in more ugly, defensive and gratuitous attacks against any camera that is not a GH5. No Mr. r041, you didn't miss it, it just slipped my mind and I never got around to it. It has been too cold here and the only shooting I've done recently has been of the train show. However, since you have a camera that has that ability, I suspect you can do this exercise yourself. I suppose it's quite possible you've already done this yourself, and the request is more rhetorical in nature, since you have apparently formulated your own answer. I recall the last time something like this came up. I provided examples of the RX10ii providing 'almost parfocal' performance. Back then I believe you had accused me of selectively providing only those clips that successfully showed this performance, deliberately withholding those clips that didn't. Quite an incentive to satiate your 'curiosity' in other areas. Beyond that, using statements like, "Or will this just result in more ugly, defensive and gratuitous attacks against any camera that is not a GH5", is not a way to engender community good will. There hasn't been a post here since 10/14, so your attacks are totally uncalled for. I don't know what happened to you Mark, but these venomous comments are a real turn-off.